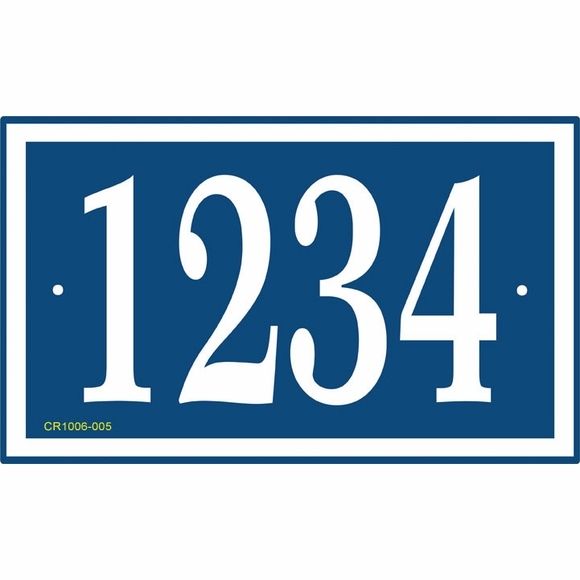 House Number Sign - - personalized 10x6 one-line address number plaque holds up to four 4" high numbers or letters (or five 3.5" high numbers or letters). Made in USA. Fast turnaround; ships in 1-2 days. Now available for wall mount and for lawn mount. Lawn style includes a 24" steel lawn stake (Comfort House CGS24001 lawn stake). Wall mount version is shown in blue with white characters. Lawn stake version is shown in green with white characters. The only difference is the placement of the holes. Both styles are available in all color combinations shown. Border is the same color as the characters and defines the rectangle shape. Comes with 3/16" diameter fastener holes and mounting screws. Lawn mount sign also includes the lawn stake. Not big enough? Not small enough? Need more lines? Need more character spaces? Need vertical orientation? We will supply your custom address sign anyway you require. Please use the Request a Custom Quote link at the top of this page.